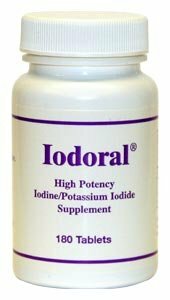 Iodoral has been formulated with the perfect balance of the two most important forms: iodine and iodide. By supplementing with Iodoral you can assure that a sufficient amount of iodine will be present for maintaining optimum function of the thyroid, skin, bones, hair and immune system. A high potency iodine/potassium iodide supplement. Iodoral? is a precisely quantified tablet form containing 5 mg iodine and 7.5 mg iodide as the potassium salt. The thyroid gland needs iodide to function properly. Iodine is essential for cell function.